SOUTH BEND, IN - The South Bend Cubs are committed to making the 2019 Midwest League All-Star Game the biggest and best in league history. Part of this goal is making the event a three-day extravaganza that will showcase South Bend, Four Winds Field, and the entire Michiana region. With Fan Fest announced for June 17 and the Midsummer Classic to be played on June 18, the organization has announced an All-Star Concert on Sunday, June 16 at 7:30 p.m. featuring the GRAMMY Award-winning artist Pitbull. This concert is the most anticipated show since Andrew Berlin bought the club in 2011. Since that time, the South Bend Cubs have put on numerous concerts each year. The All-Star Concert will by far be the largest Berlin and his team have organized. "We promised an unforgettable All-Star event for South Bend," said Andrew T. Berlin, Owner and Chairman of the South Bend Cubs. "Hosting a concert with one of the hottest entertainers in music today, is just one way we're delivering on that promise. 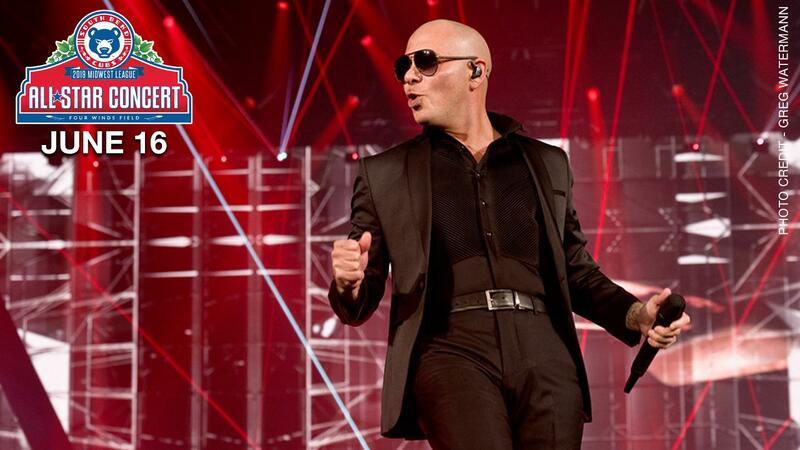 We know that fans from 150 miles in every direction will be here to see Pitbull on stage at Four Winds Field. It's a perfect way to start the week." Pitbull will headline the event along with two additional acts that will be announced in the coming weeks. The concert will act as a kickoff event for what will be an action packed three days in Downtown South Bend. Gates will open at 6:00 p.m. with music beginning at 7:30 p.m.
South Bend Cubs season ticket holders and corporate partners will have the first opportunity to purchase tickets for the concert starting on April 5 at 10 a.m. Tickets for the general public go on sale April 10 at 10 a.m. Tickets can be purchased by visiting the South Bend Cubs Box Office, by calling (574) 235-9988, or by clicking here. "We are thrilled to welcome Pitbull to Four Winds Field for the All-Star Concert," South Bend Cubs President Joe Hart said. "This is going to be a spectacular event for our fans, the city of South Bend, and the entire Michiana region. When we said the stars are coming to Four Winds Field, we didn't mean just on the field. Pitbull is a huge addition for All-Star week." Armando Christian Perez, aka Pitbull, is a globally successful artist whose relentless work ethic transformed him into a successful business entrepreneur, education ambassador, and motivational speaker. Pitbull has landed #1 hits in over 15 countries, sold over 80 million singles, has more than 84 million Facebook/Twitter/Instagram followers and over 13 billion views on YouTube. In addition to the United States, his sold-out world concert tours have taken him to North and South America, Europe and the Far East. He has also completed headlining tours in China and Japan. Along the way in his journey, he has co-headlined with Enrique Iglesias, toured with Britney Spears in the U.K. and Europe, and spoken to thousands as part of Tony Robbins' motivational seminars. Pitbull believes that music is the universal language. Among his hits are "Feel This Moment" with Christina Aguilera, "Don't Stop The Party," "Back In Time" from the action-comedy Men in Black 3, along with his second #1 hit on the Billboard Hot 100 chart "Timber" featuring Ke$ha, and the Spanish-language "El Taxi" and "Bon Bon." Pitbull is among an all-star cast providing character voice talent for the upcoming kids movie "UglyDolls." Based on the popular plush toys. Pitbull, who stars as UglyDog, joins Nick Jonas, Blake Shelton, and Kelly Clarkson and more for an adventure in discovering that imperfections make each of us unique and worth celebrating. The movie will debut in theatres on May 3, 2019. "From the start, we had a desire to make the All-Star Game from Four Winds Field a three-day event," South Bend Cubs Vice President and General Manager Nick Brown said. "This is something that no other Midwest League team has ever done. I am looking forward to the build-up to that week and challenging our staff to make it the best All-Star experience in league history. For the organization, putting on an event that each guest, player, and Midwest League executive can enjoy was the most important aspect. The Midwest League All-Star week will begin with the concert on June 16, followed by Fan Fest on Monday, June 17. Fan Fest will feature the Home Run Derby, along with autographs with six former Chicago Cubs players including Hall-of-Famers Andre Dawson and Fergie Jenkins. Tuesday, June 18 will start with the Midwest League All-Star Luncheon at 11:30 a.m. at the Century Center with Keynote Speaker and MLB Hall-of-Famer Ryne Sandberg. The Midwest League All-Star Game will take place on Tuesday night with first pitch at 7:35 p.m.